Dale has been waiting for a few months to come over to us. 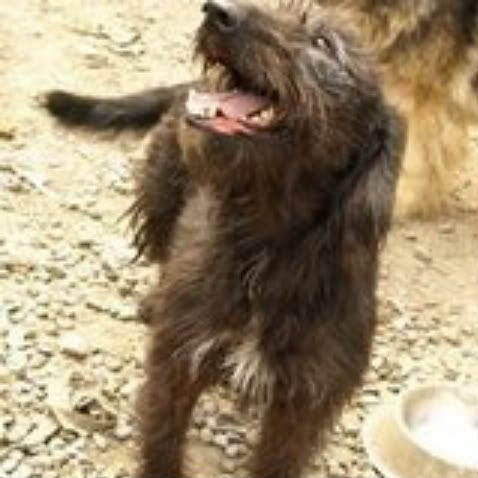 He is in the Irish Rescue that we work closely with; where Annie and Bonnie and Bran came from. We couldn't agree to take Dale earlier as we always put the English Dogs first. Grace was going to come into us today, but has now found her forever home, so we have agreed for Dale to come over and into Southern Lurcher Rescue care. Dale has been with his foster home in Ireland for nearly 2 years and not a sniff of a home. He was found in a dark shed along with a poor wretched greyhound, who didn't survive. He was very traumatised and scared of everything. With the loving care of his foster mum "an Irish Angel" he has been turned around and she has given this dog so much love and devotion she wants to see him as happy as Bonnie. Dale is probably between 3-5 years old. 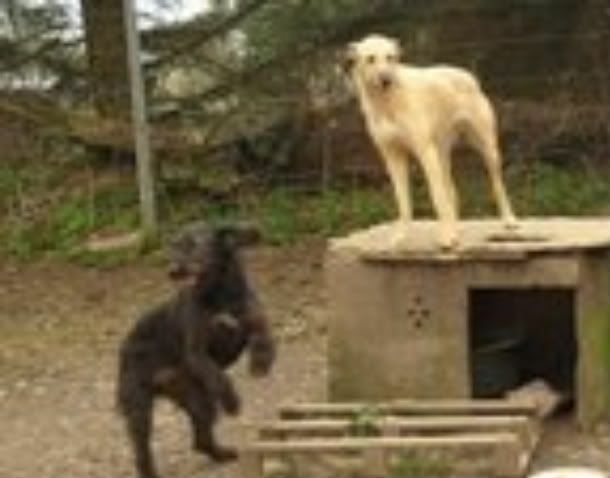 He has been neutered, vaccinated and will be microchipped to Southern Lurcher Rescue when he arrives. 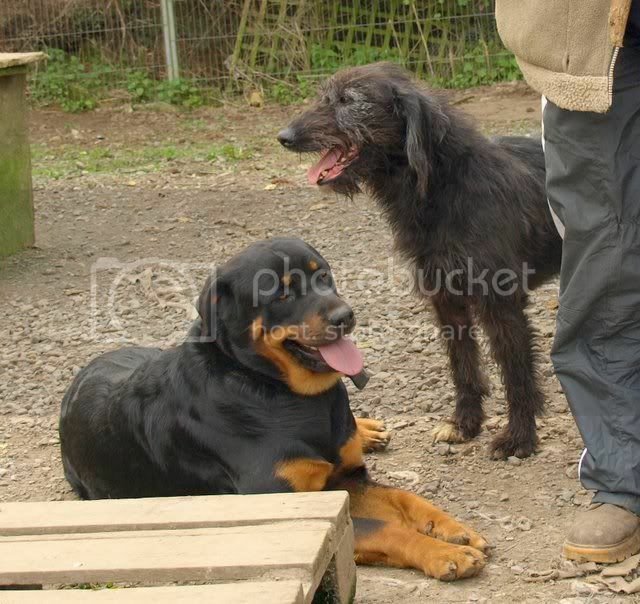 He is probably deerhound/beardie x, but he is a big stocky lad, and was Bonnie's best friend when they were together. Arrival date is yet to be sorted, but could be later this week or next week. 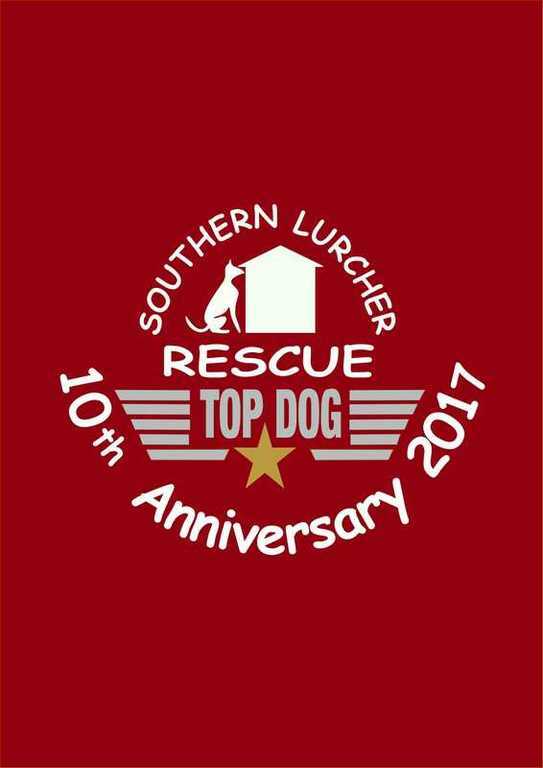 At Southern Lurcher Rescue, we put our English dogs first.... and Dale has been waiting in the wings for over two months for us to help him.... So now.... come on over Dale. And start your new life. Here are a couple of piccies of the lovely lad. And with Bonnie before she came over. 2 years in his foster home? Poor lad, he'll be wondering what on earth is happening to him! I hope he gets a lovely new home soon, he so deserves one. And no, it can't be me! 2 years in his foster home? Poor lad, he'll be wondering what on earth is happening to him! 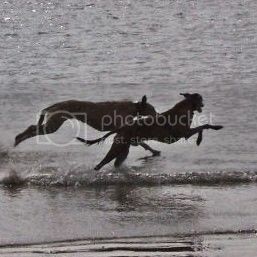 Bonnie was his playmate for all that time until she crossed the Irish Sea, & just look how she's landed firmly on her paws! We will of course do everything in our power to find Dale an equally happy, loving forever home. I know I ask this every time but any idea if he is cat or child friendly? Patience Vicky - the lad hasn't even booked his night ferry ticket yet! When he does arrive in the UK he'll be coming to me for full assessment; in the meantime we'll glean whatever information we can about him, & will pass this on. It's just sooo frustrating! I really want to help! Maybe I should have fallen for a more cat friendly breed!! Not one any where near as lovable as the noble lurcher! Trust me - the ideal one for you is out there somewhere! Dunno yet about Dale being cat friendly, but he certainly appears to be at ease in the company of Rotties! Dale looks like just the sort of chap we are looking for. We do need him to be child and cat friendly. We will watch this space but please let us know as soon as you can! If you want to register your interest in Dale you will need to email Barney or myself for an application form. A homecheck is necessary too. We do have a couple interested. Dale should be coming over on Tuesday night's ferry. I'm very much hoping to be able to take him down to Hayling Island to renew acquaintances with his old mucker Bonnie before someone deprives me of his company to go to his forever home. That's now been amended to Wednesday's ferry, so I'll be picking him up early Thursday morning. Nope, he won't be travelling alone Jean: the very well-equipped courier's large van will unfortunately be full of dogs seeking a better existence than they've been hitherto used to, but t'others are bound for different destinations, so even though the temptation will undoubtedly be there, I'll not be able to succumb.